Boko Haram releases schoolgirls three years after kidnapping. Boko Haram releases 83 Nigerian schoolgirls who were kidnapped three years ago. Eighty-three Chibok schoolgirls seized three years ago by Boko Haram in northern Nigeria have been released into military custody, authorities say. The dramatic development came on Saturday after the mass abduction that brought the extremist group’s rampage to world attention. Nigeria’s government says the schoolgirls were released in exchange for detained Boko Haram suspects and are expected to meet President Muhammadu Buhari on Sunday in the capital. Family members said they were eagerly awaiting a list of names and “our hopes and expectations are high”. 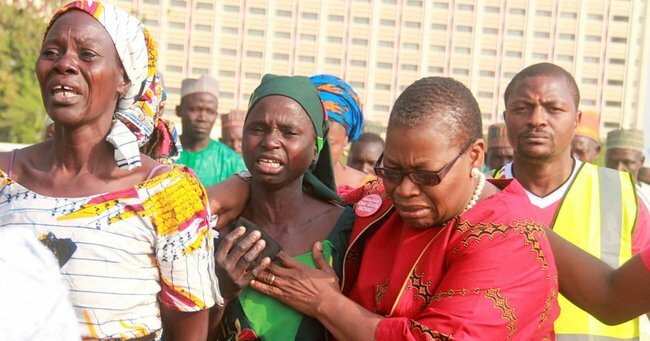 It was the second group release of Chibok schoolgirls. Nigeria’s government in October announced that 21 girls had been freed after negotiations with Boko Haram, saying another group of 83 would be released “very soon”. Before Saturday’s release, 195 of the girls had remained captive. “Huge numbers,” the personal assistant to President Buhari, Bashir Ahmad, tweeted late on Saturday. A Nigerian military official with direct knowledge of the rescue operation said the 83 freed girls were found near the town of Banki in Borno state near Cameroon. “The location of the girls kept changing since yesterday when the operation to rescue them commenced,” said the official, who spoke on condition of anonymity because he was not authorised to make the announcement. The 276 schoolgirls kidnapped from Chibok in April 2014 are among thousands of people abducted by Boko Haram over the years. The mass abduction shocked the world, sparking a global #Bringbackourgirls campaign supported by former US first lady Michelle Obama and other celebrities. It has put tremendous pressure on Nigeria’s government to counter the extremist group, which has roamed large parts of the north and into neighbouring countries. Many of the kidnapped girls, most of whom were Christians, were forced to marry the Islamic extremists and became pregnant. Human rights advocates believe others could be among the young girls who have been used to carry out suicide bombing attacks. The group representing the families of the girls said they were awaiting direct confirmation from the government. “This is a very, very exciting news for us that we have over 80 of our girls coming back again,” said Bukky Shonibare with the #BringBackOurGirls campaign.